Hello and welcome to our final newsletter of 2017! This month we led a Japan-UK life sciences session at Genesis, for which I would like to thank our speakers from AMED, LINK-J, Imperial College London and Imanova, and we have included the presentations below for those who couldn’t make it. Eliot and I met with Lord Henley, the new Parliamentary Under-Secretary for the Department for Business, Energy and Industrial Strategy, who has recently taken on the life sciences brief, following the departure from Government of Lord Prior. This was an introductory meeting, but we had a useful discussion about next steps on the Industrial Strategy. MedCity was part of a group of cluster organisations meeting with the minister, including colleagues from the NHSA, G4W and NHS Research Scotland, and it is very positive to be working with colleagues as we look at the “place” and cluster related issues emerging from the strategy and the Life Sciences Sector Deal. Just a heads up for those of you who are attending J.P. Morgan week in San Francisco at the start of January, do come along to our ‘Generation Genome’ session with the BIA and Genomics England on 8 January where Eliot will be speaking alongside Genomics England, Congenica, Inivata and others. You can sign up here. Congratulations to King’s College London’s Professor Fiona Watt FRS who has been selected as the government’s preferred candidate to be the Executive Chair of the Medical Research Council in April 2018. Finally, thank you to everyone who has come along to our events, taken part in our programmes and campaigns, sought our expertise, and everyone we have connected with this year! 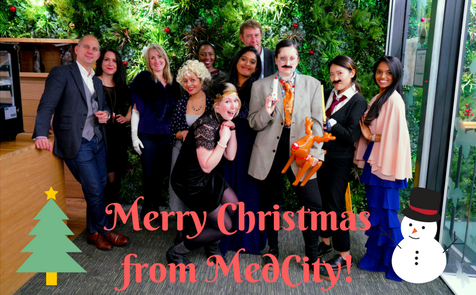 It has been another fantastic year for MedCity and I wish you all a restful break and I look forward to seeing everyone in 2018. Following this week’s $110m Series B fundraise, we spoke with Mark Rothera, CEO and President at biotech company, Orchard Therapeutics. Biomedical Research Centre Showcase 2018! Following the success of our NIHR BRC Showcase in February this year, we are joining up with Cambridge, London and Oxford BRCs and the Cell and Gene Therapy Catapult to hold a follow-up event on 15 March 2018. A new paper by the Oxford Martin School calls for ‘open science’ approaches to drug discovery and offers ways forward that would transform how the medical challenges of this century could be addressed more efficiently. The first drug targeting the cause of Huntington’s disease was safe and well-tolerated in its first human trial led by University College London scientists. An award-winning project between the ambulance service and Cambridge University Hospitals NHS Foundation Trust and Princess Alexandra Hospital is set to be rolled out across the whole of NHS potentially saving millions of pounds. Great news for Barts Health NHS Trust and Queen Mary University of London this month as their Haemophilia A gene therapy trial has produced groundbreaking results. All 13 patients are now off treatment with 11 producing near-normal levels of the protein. We presented a session at One Nucleus’ Genesis last week, looking at collaboration opportunities for Japan and the UK. Take a look at the presentations from four of our speakers here. The next edition of MedCity Update will be sent in January 2018.